Tag rugby is a non-contact, fast-moving game that is suitable for adults or children, and for boys and girls to play together. It's played extensively in Quins, especially for the under-7s who are too young to play 'full contact'. It's fast-paced and played on small-sized pitches ideal for these lively age groups. 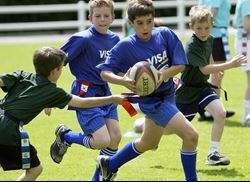 It’s safe, non-contact nature, combined with the fun and liveliness of the sport, means that tag rugby is now the RFU’s official version of the game for under-7s and under-8s. The use of a either a tag belt or tag shorts replicates a tackle and is clearly seen when an effective tag has been made. Teams are seven-a-side with a preferred gender mix of at least three men and women playing at one time. (Teams can choose the gender of the seventh player). The game has suggested progressions to allow the development of players and introduce more elements of the 15-a-side game. Tag rugby is used to teach players to see where space is and encourage evasive running into spaces and not faces.